In February 1915, the Cornish miners in the 25th Field Ambulance were involved in a tragedy that touched the very top of military command. Towards the end of the month a freak accident occurred which resulted in the death of Brigadier General Sir John Gough, one of the most prominent figures in the army. He was visiting a trench near Estaires on 20 February 1915 when a bullet richoted off a wall and hit him in the stomach. Despite the efforts of a prominent surgeon, he died two days later. 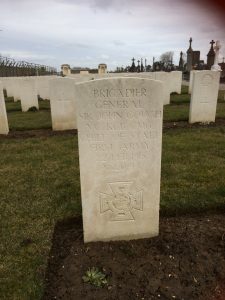 He was buried in Estaires cemetery and the Field Ambulance lined the route. We found his gravestone in Estaires cemetery on our recent visit. 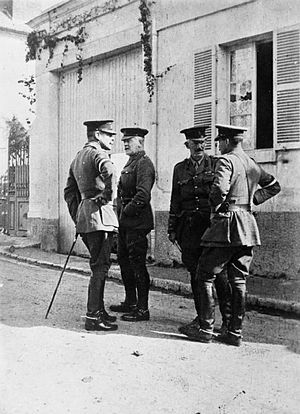 Pictured above: Brigadier General Sir John Gough (second-from-right) talking to Brigadier General E. M. Percival. Also in photo are Lieutenant General Douglas Hais and Major General Charles Monro. France 1914.